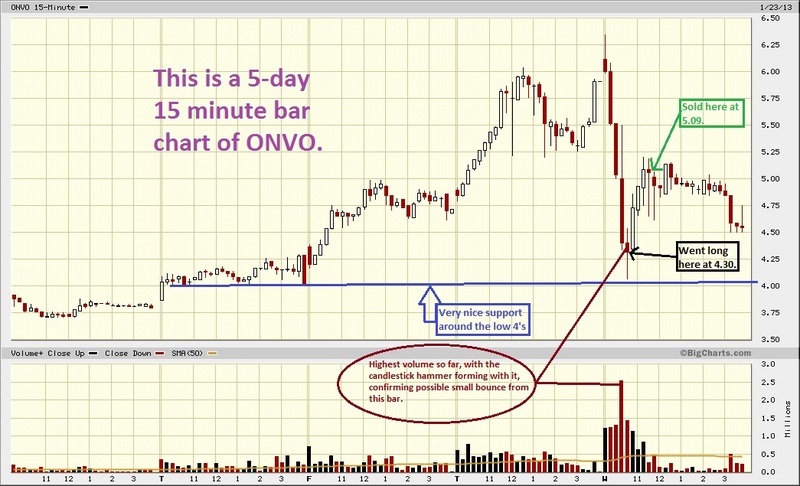 TRADER 9: Trade of the day, ONVO!!! ONVO has treated me well the last 2 days (read previous blog post) with over $1500 in profits, on just 2 round trip trades of a 1000 shares each. I ended up almost catching the bottom today when it sold off and hit a low of 4.07. Went long ONVO on a 1000 shares at 4.30 when I say the candlestick hammer was about to form on the 15-minutes chart. My profit target was at least 4.90, but when it broke through 5.00, I decided to hold on for a bit longer, and sold it at 5.09 for a .79 point gain. By the way, got stopped-out of UVXY again today, after I moved my stop up for break-even. I’ll be playing it (UVXY) tomorrow morning again. CAN’T STOP, WON’T STOP!! !